As far as I am concerned, you can never have enough throw pillows. 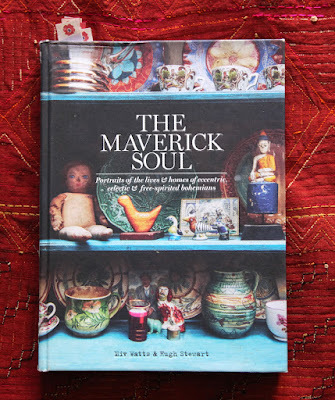 I have made many over the years - from my embroidered crewelwork to recycled antique fabrics, even handknit. 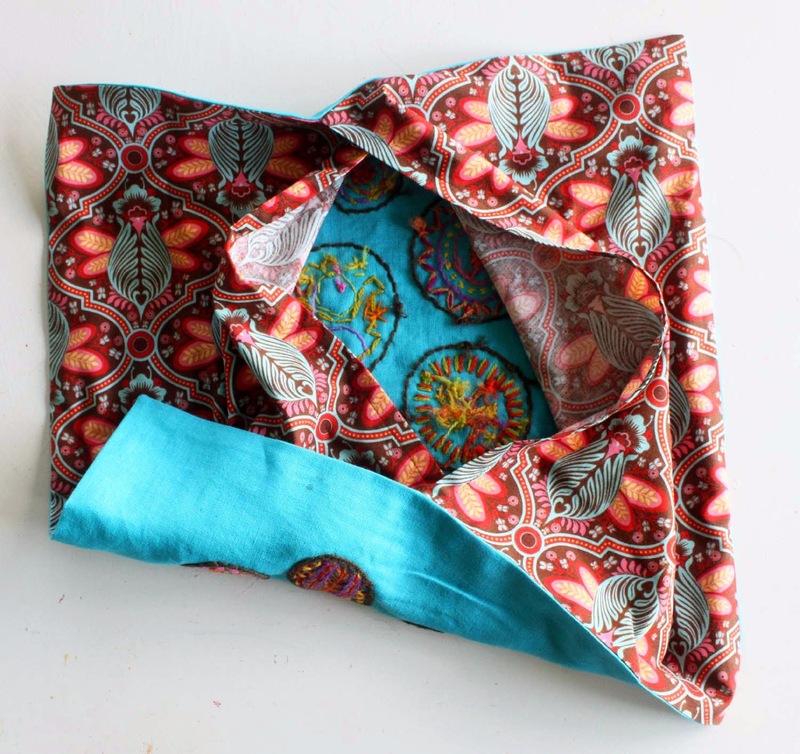 My favorite way to back a precious fabric is with a flapped back - thus making the pillowcase easy to remove and launder (or dry clean if need be). 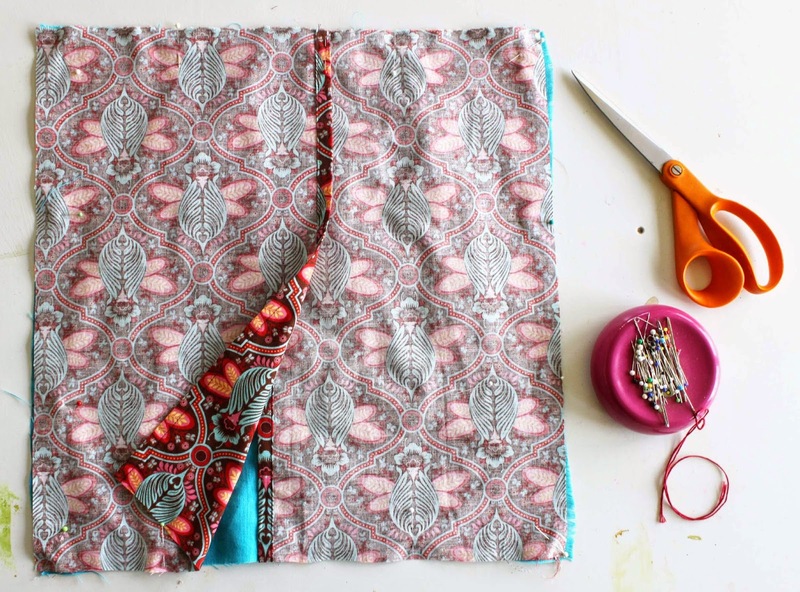 Here's how I make a flap back removable pillow cover. 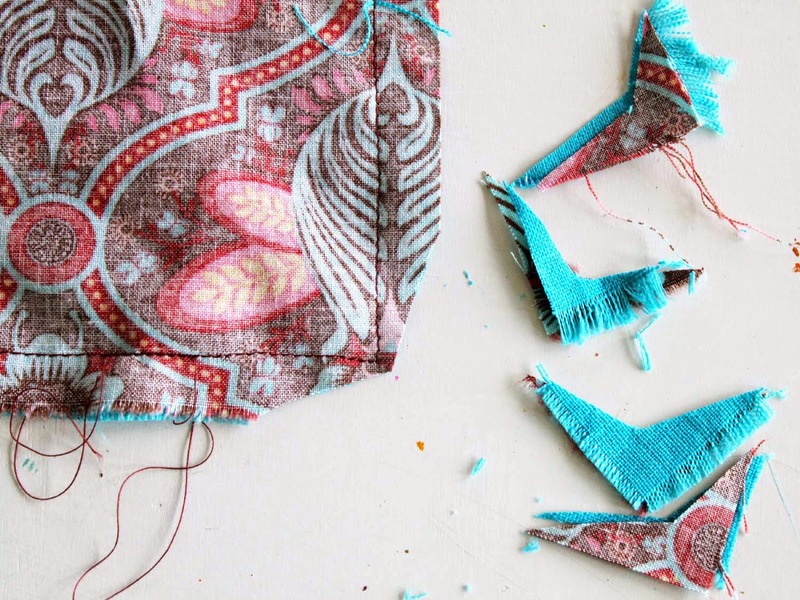 It is a super simple method and can be made in a little over an hour. 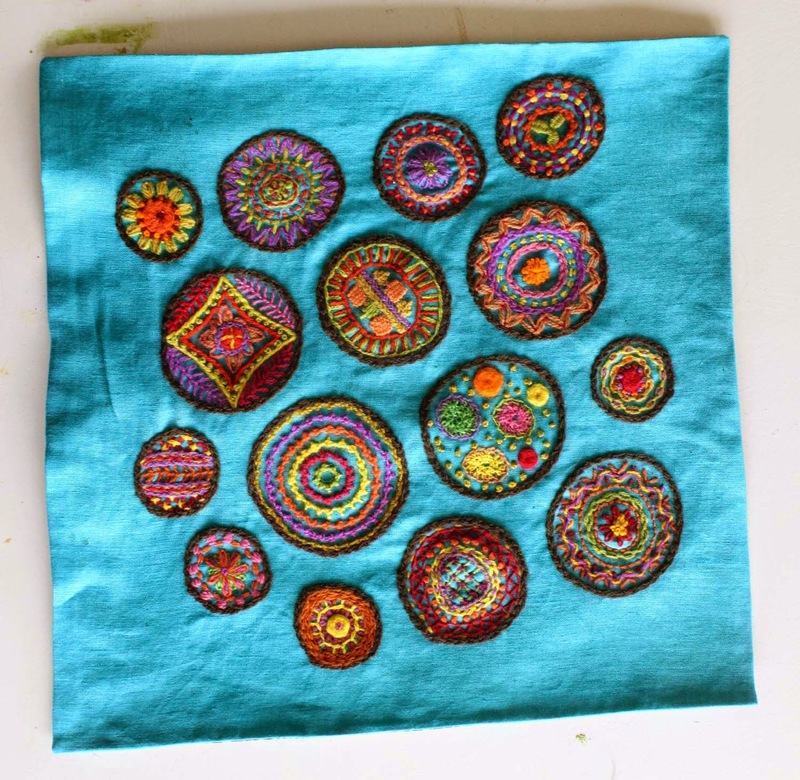 It is shown on my Circles Sampler Pillow Project. The front was worked in Crewel Embroidery. You can purchase the PDF pattern here. A kit is also available here. 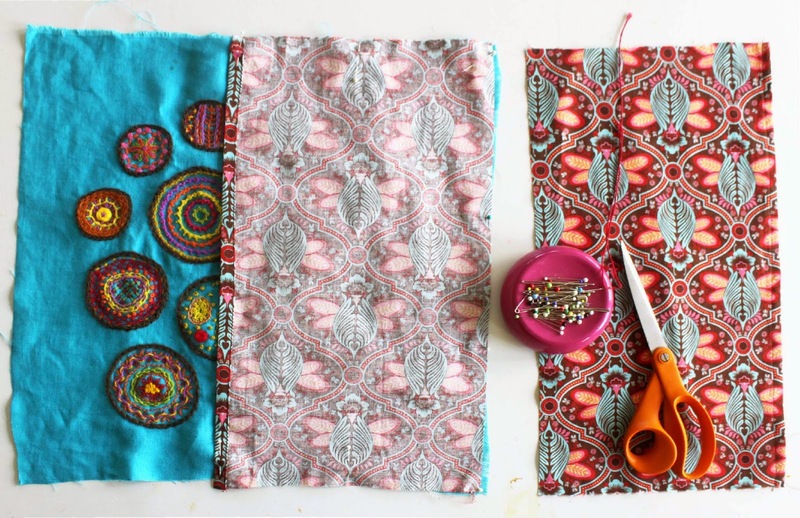 I use a sewing machine but if you don't own one, the method can be used for hand-sewing too. 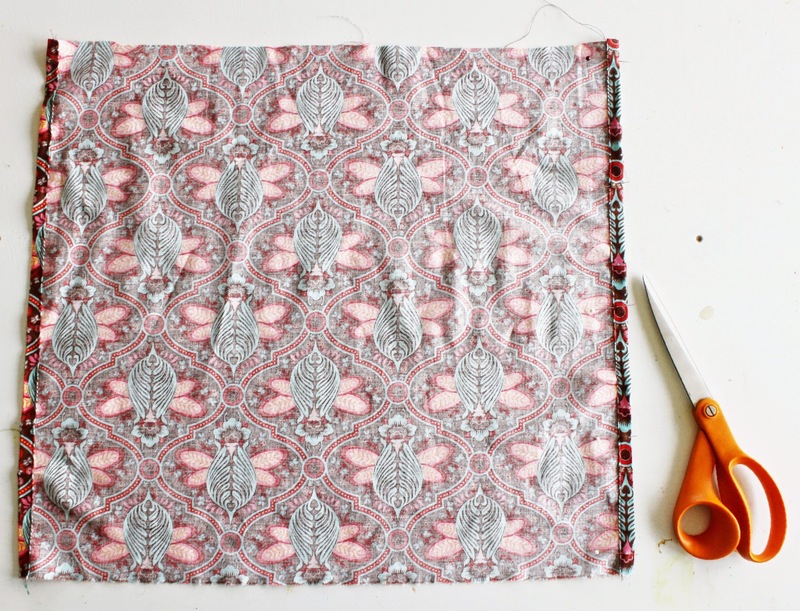 Step 1: You will need a piece of quilting weight cotton as long as your embroidered pillow front. I usually purchase a couple of inches extra. 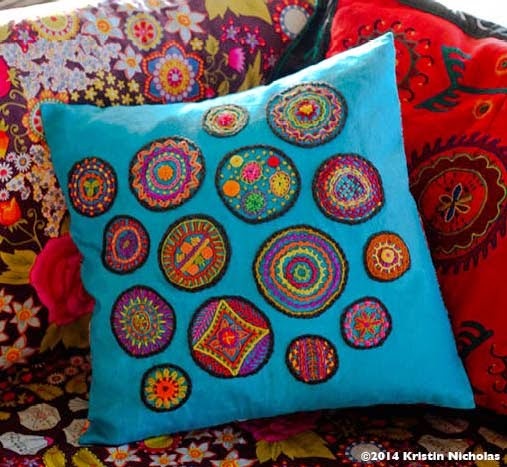 For an 18" pillow, purchase 5/8 yard of a colorful fabric that picks up the colors you used in your embroidery. Remnants are a great choice for backing pillows. 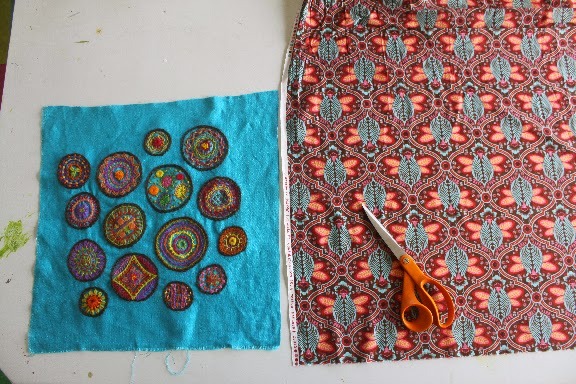 Step 2: Iron both embroidered pillow piece and backing fabric. Lay the pillow front on top of the backing fabric. Cut evenly around 3 sides. On the 4th side, add 4" in width. Draw a straight line and cut along that line. 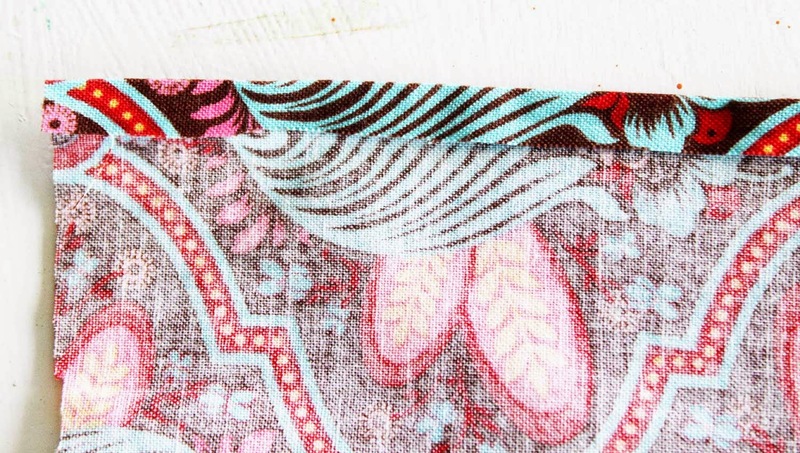 Your cut backing fabric will look like this when the pillow front is laid on top of it. Notice the 4" extra of backing fabric at the right of the photo. 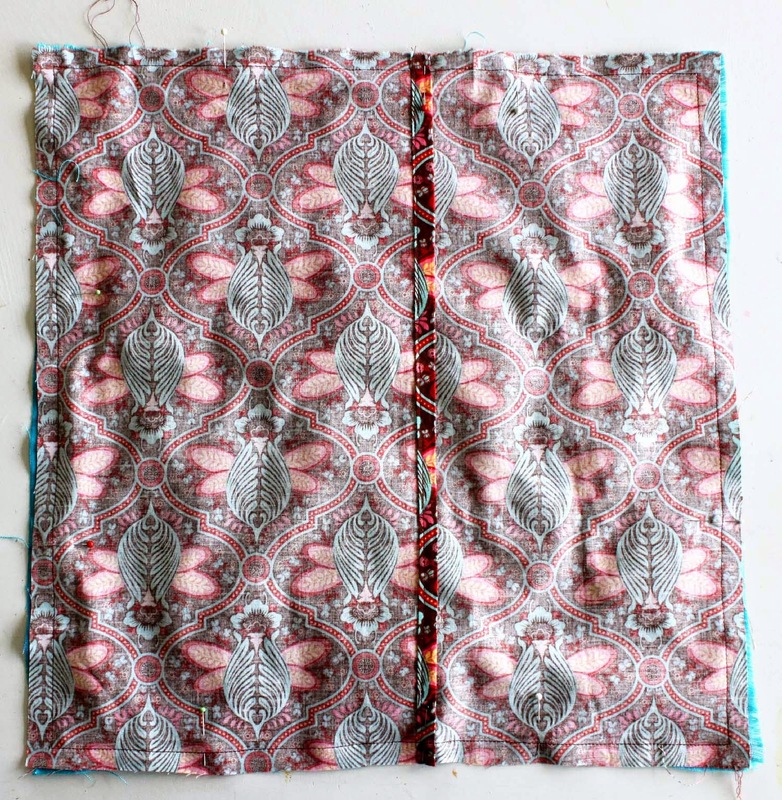 You will hem both sides of the wider section of the fabric. 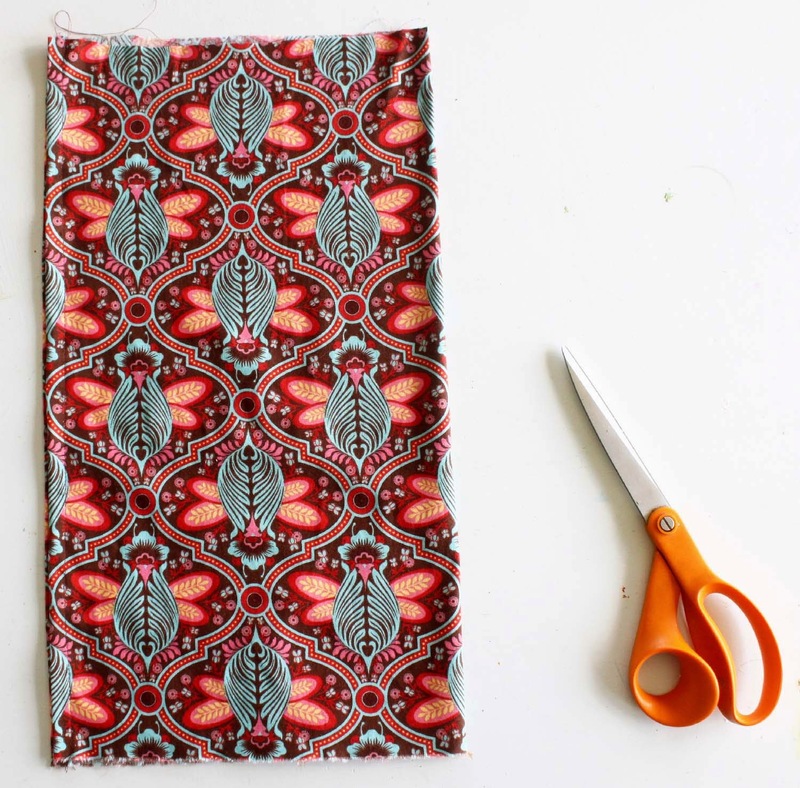 Step 3: At opposite edges of the width of the fabric, turn under 1/4" and press with an iron. Turn under again 3/8". 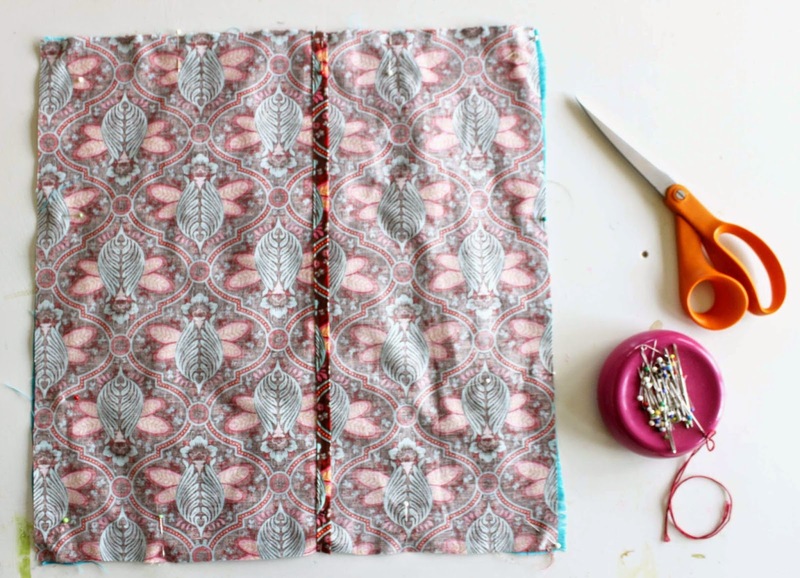 Pin and press the folded edges. These edges will form the overlap of the pillow so they need to be finished. 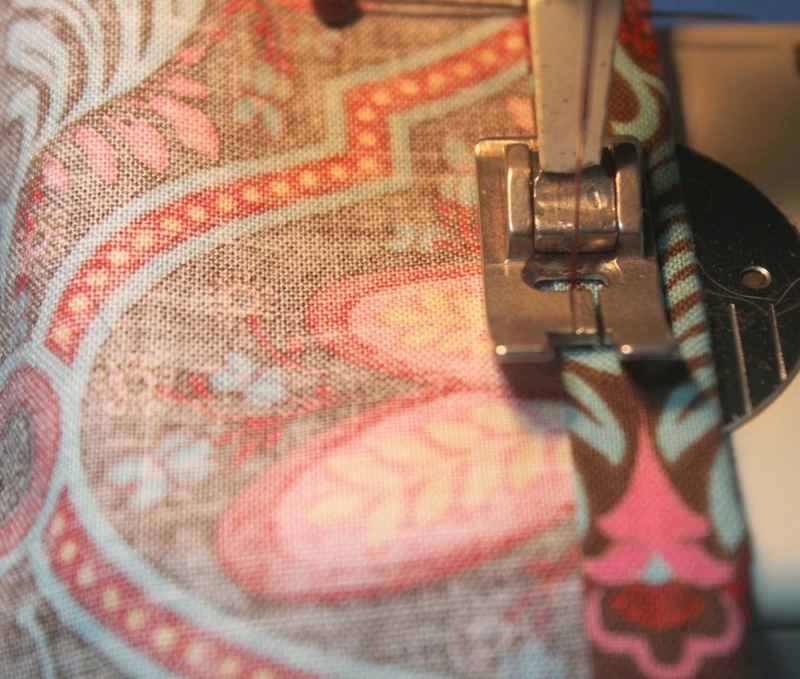 Turning folded edge under 3/8"
Step 4: Using a sewing machine, sew along the folded edges of the pillow backing. 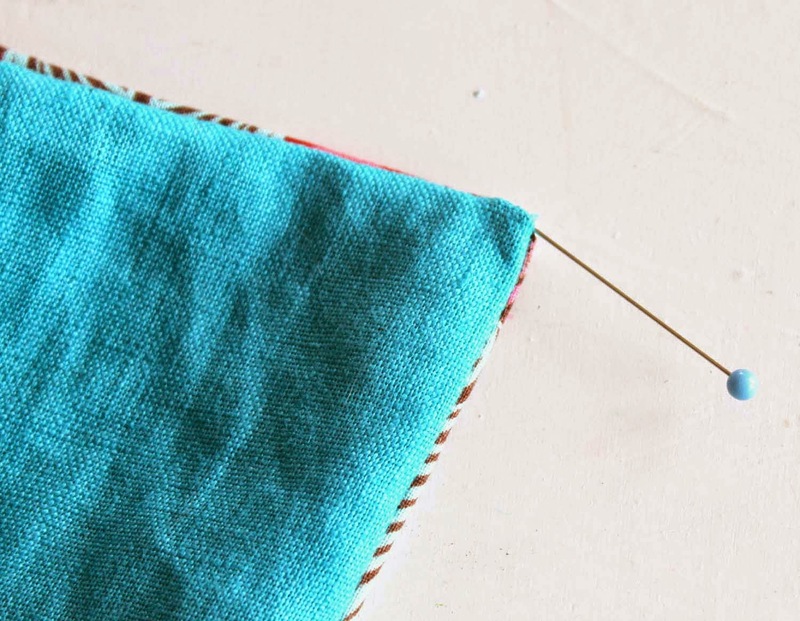 Your stitches should go along the fold, catching the pressed layers with the main section of fabric to create a clean edge. 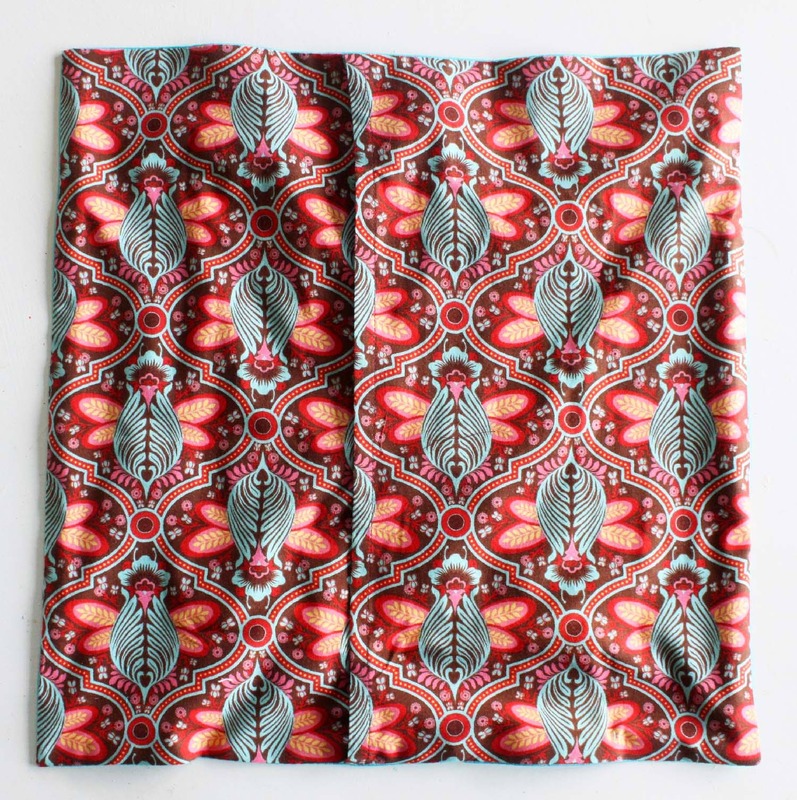 This is what the piece looks like now - both edges are hemmed. Step 5: Fold the fabric so that the hemmed edges are together. Press so there will now be a pressed line at the center of the fabric. 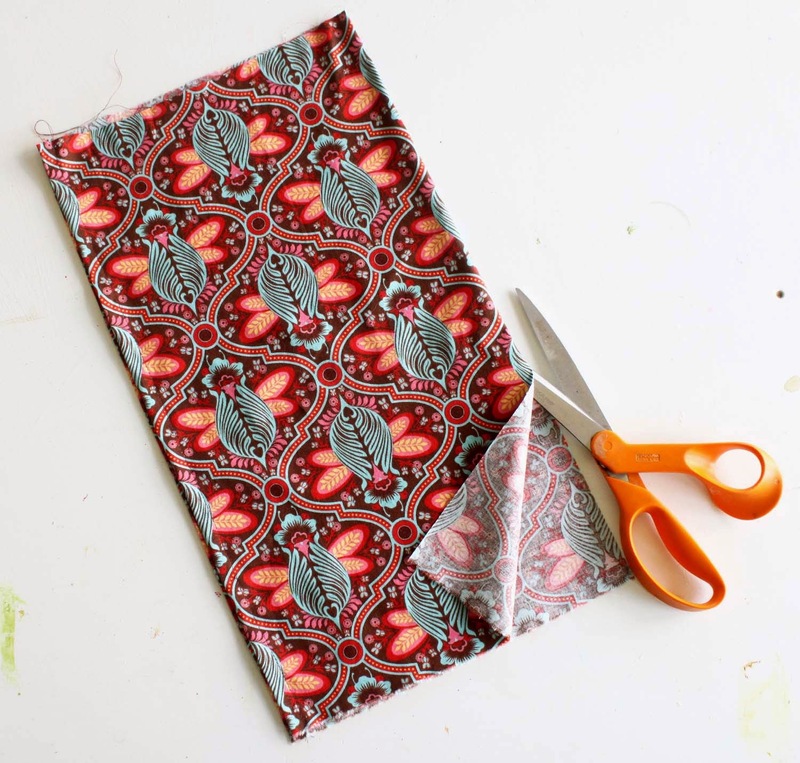 Using your scissors, cut this piece in two along the fold. 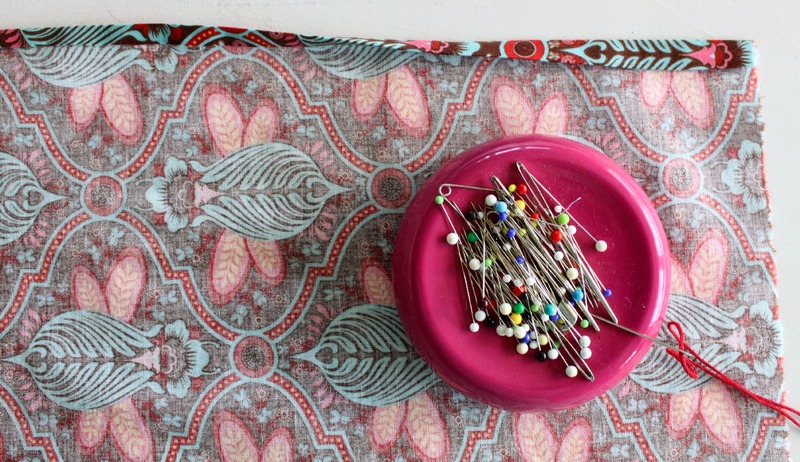 Step 6: You will now pin the backing pieces to the pillow front. 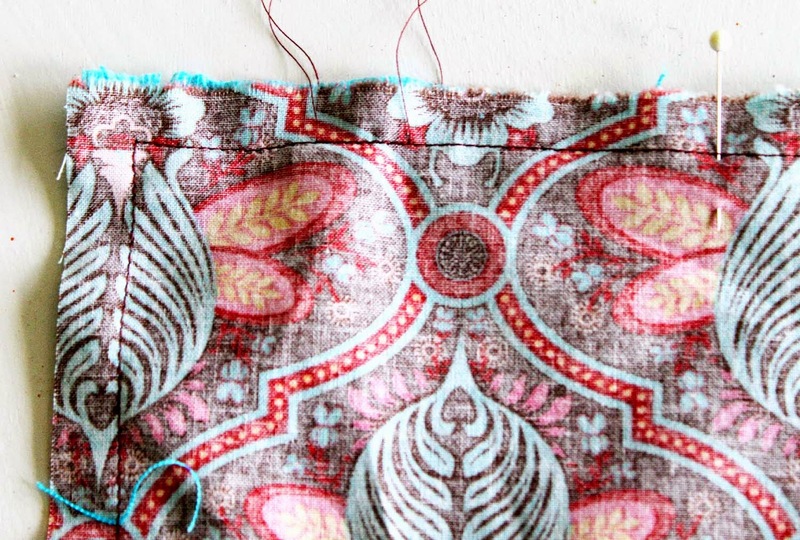 Place one of the hemmed pieces with its right side down facing the right side of the pillow front. The hemmed edge should be at the center of the pillow. Pin along the three outside edges. Pin the remaining backing piece to the pillow front lining up the raw edges of both the backing piece and the pillow front. The hemmed edge will be at the center of the pillow. The two backing pieces should overlap. Pin all around the pillow. Step 7: Using a sewing machine, with a 1/2" seam allowance, sew all the way around the outside of the pillow, removing pins as you sew. 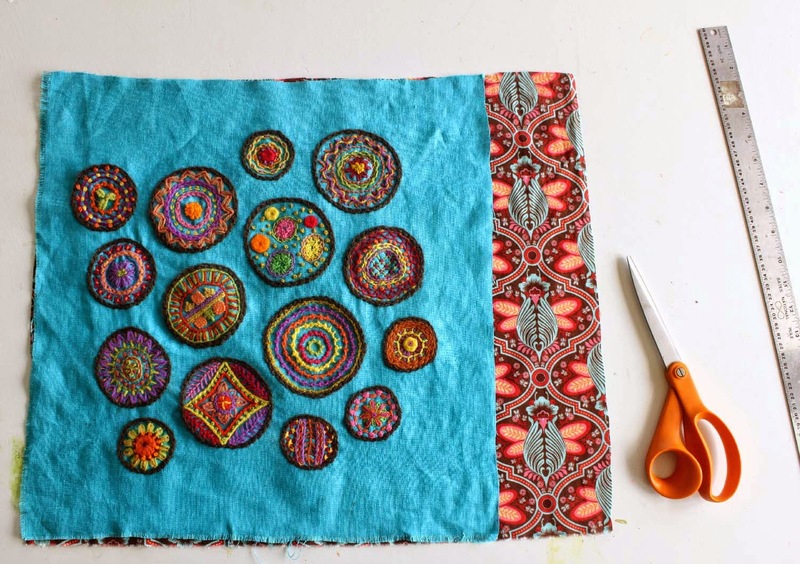 Overlap the beginning and ending stitching points. This is the finished pillow after sewing. Step 8: Trim each of the 4 corners of the pillow as shown below. This will make the corners less bulky and easier to turn. Step 10: Turn the pillow inside out. 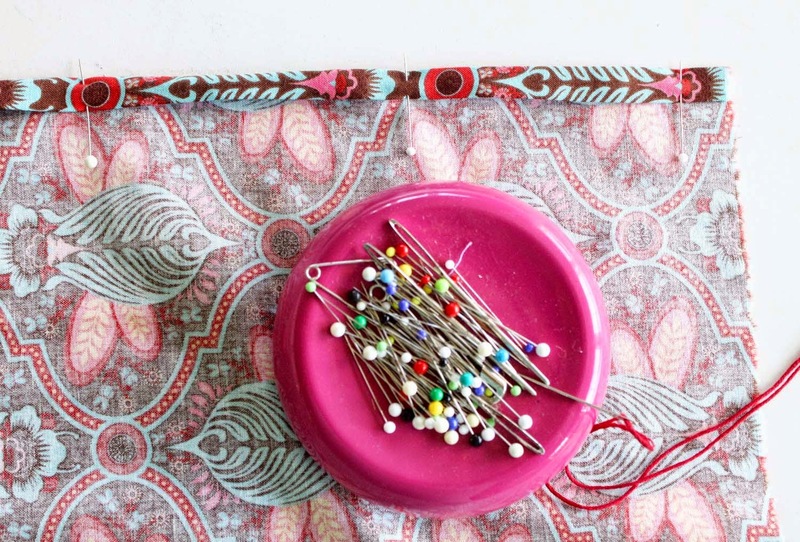 Pull the corners out using a pin so that they are nice and pointy. Step 11: Press the seamed edges of the pillow so that it is neat and crisp. This photo shows the back of the pillow with the overlapping edges. This photo shows the overlap. Now stuff your pillow with a down or polyfil pillow form. I purchase my down pillow inserts here. Your cover is removable and can be washed or drycleaned at any time. That's it! Easy and professional looking. What a great tutorial! I am not an experienced sewer. With your instructions, I believe that I could make a nice looking pillow! 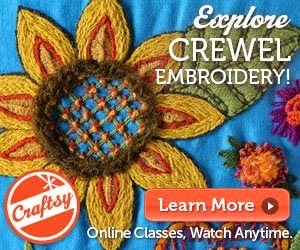 The colors in the embroidery are so pretty on the turquoise and the choice of fabric for the back is perfect! I got to visit some of your creations again at Sally's in Maine, it is always so inspiring to me. Thanks for this excellent tutorial. I have a bunch of pieces waiting for me to learn how to make them into cushions and this will nudge me in the right direction.